Waterbury (nicknamed "The Brass City") is a city in the U.S. state of Connecticut on the Naugatuck River, 33 miles (45 minutes) southwest of Hartford and 77 miles (90 minutes) northeast of New York City. 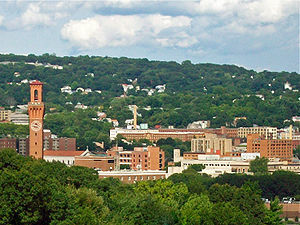 As of the 2010 census, Waterbury had a total population of 110,366, making it the 10th largest city in the New York Metropolitan Area, 9th largest city in New England and the 5th largest city in Connecticut. Established in 1894, St. Joseph's Church holds the distinction of being the first Lithuanian worshiping community in Connecticut. The first Unico Club was founded in Waterbury in 1922. It now has 8,000 members and 150 regional groups. The membership is composed of business and professional people of Italian lineage or those who are married to an Italian-American. The clubs sponsor educational, cultural and civic programs. W1XBS in Waterbury was one of only four radio stations in the country that began experimental high fidelity broadcasting in 1934. The station broadcast at 1530 kc, and joined the CBS Radio Network on December 1, 1938. They moved to 1590 kc and changed the call letters to WBRY in 1941, in accordance with the North American Radio Broadcasting Agreement. The station's broadcasting license was cancelled in 1998 to allow New York's WWRL to be upgraded; at the time it had been known as WQQW. Victor Zembruski started his Polish Eagles show on Waterbury radio station WATR in 1934. It is now the oldest continuously broadcast show on American radio. Commuting in the Greater Waterbury area consists of multiple public transportation options. CT Transit operates a significant amount of city buses running from the city center at Exchange Place to various neighborhoods in the city. Metro-North Railroad runs commuter trains multiple times a day between the Waterbury station and Bridgeport, with connections to Grand Central Terminal in New York City. The two main highways that run through the heart of the city are I-84 (Yankee Expressway) and Route 8. In the downtown area, I-84 and Route 8 are located on the elevated William W. Deady bridge, known locally as the "MixMaster" with eastbound traffic on the upper deck and westbound traffic on the lower deck. The interchange is ranked as one of the most heavily congested traffic areas in the New York/Connecticut region. Waterbury is the most heavily Italian-American large city in Connecticut today with 18.4% of its population claiming Italian heritage in 2010. The Italian influence is especially strong in the Town Plot, Brooklyn, and North End neighborhoods. Additionally, the city is home to thriving Puerto Rican, French-Canadian, Portuguese, Lebanese, Lithuanian, and Albanian communities. Waterbury has strong Irish roots as well, especially in Washington Hill, which is home to the city's annual St. Patrick Day's Parade, which, oddly enough, is rarely held on St. Patrick's Day itself. At the beginning of the 21st century, Waterbury had a growing Orthodox Jewish population. Waterbury's scandalous past dates back to 1940 when Mayor T. Frank Hayes and 22 others were convicted of conspiracy to defraud the City of Waterbury. Hayes received a 10–15 year sentence and served six years. Ironically, the massive corruption scheme was exposed with the help of then comptroller Sherwood Rowland, grandfather of Gov. John G. Rowland, who was convicted on corruption charges in 2004. The 2007 lulu.com book, Publisher vs. Politician: A Clash of Local Titans, by author William A. Monti, is an account of the rise and fall of T. Frank Hayes and focuses on his election campaigns, his bitter fights with William J. Pape, publisher of two local newspapers, and his ultimate trial, conviction, and sentencing for corruption. Ironically, what appeared to have been a defeat for Hayes was not really a victory for Pape, and the stage was set for further corruption in Waterbury in the second half of the 20th century. Waterbury was in serious financial straits due to years of mismanagement, resulting in the city's finances being take over by the State of Connecticut. The State Oversight Board oversaw city business for several years and have since left following consecutive years of balanced budgets. The successors to Philip Giordano, former Acting Mayor Sam Caligiuri (2001) and former mayor Michael Jarjura (2001–2011) managed the city without major controversy since 2001. Democrat Neil O'Leary was elected the 46th Mayor of Waterbury on November 9, 2011. As of July 2012, the Mayor of Waterbury earns an annual salary of $119,306. Waterbury is home to a total of 41 schools, 9 of which are high schools (private and public). The city's public schools are operated by Waterbury Public Schools under the leadership of superintendent Dr. Kathleen Ouellette and a board of education that consists of ten elected members and the city mayor, who acts as the chairman ex-officio. Waterbury is home to two colleges, Post University, a private liberal arts college,and Naugatuck Valley Community College as well as three regional university campuses: The University Of Connecticut, University of Bridgeport and Western Connecticut State University. Rescue Engine 1 Truck 2 Haz-Mat. 9, Collapse 9 1979 N. Main St.
Engine 2 Truck 3 519 E. Main St.
Engine 4 Foam Trailer 823 Baldwin St.
Engine 5 1956 E. Main St.
Engine 6 431 Willow St.
Engine 7 Battalion 2 315 Walnut St.
Engine 8 197 Bunker Hill Ave.
Engine 11 740 Highland Ave.
Truck 1 Car 5(Deputy Chief) 26 Field St. The Waterbury Police Department (WPD) was founded in 1853. Headquarters is at 255 East Main Street, while the Waterbury police academy is located at the Waterbury Police Department Annex at 240 Bank Street. Chief of Police is Vernon Riddick, who holds the distinction of being the first African-American to hold the position in the departments history. The Waterbury Police Athletic League (PAL)is one of the top-rated PAL associations in the nation. The PAL headquarters is located in the city's North End and consists of mix-use buildings and a state of the art athletic complex. The department's Community Relations division plays a key role in PAL's operations. Waterbury is a city of neighborhoods, and their character is shaped by the history and geography of the city. Constructed by the architectural firm of McKim, Mead & White of New York for the New York, New Haven and Hartford Railroad Company, the Union Station on Meadow Street was modeled after the Torre del Mangia at the Palazzo Pubblico in Siena, Italy. 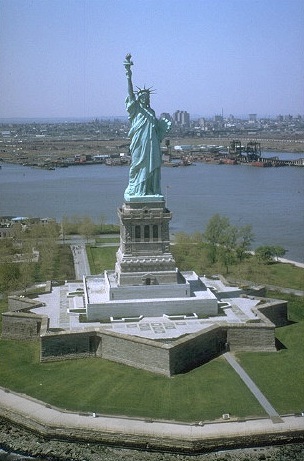 It cost $332,000 to build in 1909. The clocktower is 240 feet (73 m) high and has 318 steps. 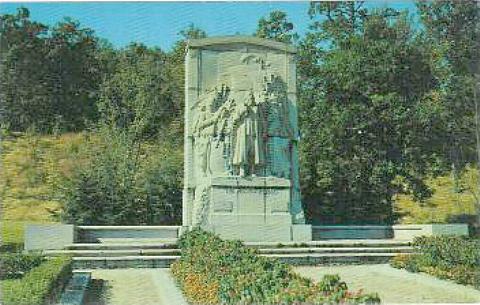 The clock was made by Seth Thomas Co. with a dial 16 feet (4.9 m) in diameter with 5-foot (1.5 m) tall Roman numerals. The eight she-wolf gargoyles are a reminder of the myth of Romulus and Remus. The tower opened July 12, 1909. Union Station is now the home of the Waterbury Republican-American newspaper, and the city's Metro-North railroad station is on a platform next to the building. The Apothecary Building, the focal point of Exchange Place in the center of Waterbury at the intersection of South Main and Bank streets, was built in 1893 and housed the Apothecaries Hall Pharmacy for over 70 years. In August 2010, PM Architecture in New York City announced plans to convert the Apothecary, into 12 luxury apartments. The project was completed in Fall of 2013. And hear your nation say, God bless you all! They call you dead and lo ye grandly live. Shrined in the nation's love forevermore! Chief Two Moon Meridas built his laboratory building on East Main Street in 1925 and manufactured his world famous herbal medications there until his death in 1933. The Indian Heads and two moons engraved on the front exterior walls have recently been removed. The original cross was 32 feet (9.8 m) tall and was erected in 1956. The cross was dedicated to world peace in a ceremony attended by 1,200 people in November of that year. It was the beginning of Holy Land. That original cross was then replaced in 1968, by a cross of steel girders and plastic that housed fluorescent lights that reached 56 feet (17 m) into the sky. That cross was dedicated to peace and also to the slain John and Robert Kennedy. In April 2008, workmen took down the former cross, which had become unstable from years of weathering and repeated attacks by vandals. The Religious Teachers Filippini, an order of nuns that owned the property, paid $250,000 to have it replaced with a cross that was shorter, thinner, but more durable. On June 18, 2008, the new 50-foot (15 m) cross was blessed and rededicated by Archbishop Henry J. Mansell. This smaller new cross, which was not internally illuminated like the previous ones but instead lit by surrounding floodlights, was met with disappointment due to the fact that the beloved city landmark was hardly as visible as the previous crosses. After years of decay and neglect, Holy Land was purchased by a group led by Mayor Neil O'Leary and local car dealer Fred "Fritz" Blasius on June 20, 2013 for the sum of $350,000 with a plan to clean and revitalize Holy Land as part of a community effort. The effort was met with enormous support from the community as thousands of local residents and businesses donated. In October 2013, the smaller unilluminated steel cross was removed to make way for a new 52 feet (16 m) internally lit steel cross which was donated by local businessman Giuseppe Pisani and his company, Pisani Steel  The new cross is expected to be completed and dedicated for Christmas of 2013. The group, known as Holy Land of Waterbury USA, Inc. continues to garner donations and volunteers for further revitalization projects through their website www.holylandwaterbury.com . Waterbury-born John Fusco, noted screenwriter and novelist, wrote Paradise Salvage (Simon and Schuster 2001), a novel set in Waterbury. The Italian-American coming-of-age story was inspired by several incidents of civic corruption in the Brass City. In the famous Arthur Miller play, Death of a Salesman, the main character Willy Loman mentions Waterbury as one of his recent stops on a business trip. The name "Waterbury" appears in the cargo hold on the ship when traveling across the ocean in the 2012 game Assassin's Creed III. Waterbury is a main gathering point for rebels in "Requiem," the third book in Lauren Oliver's Delirium Series. William H. Bristol, inventor and manufacturer, was born in Waterbury. Invented the "Bristolphone" to simultaneously record voices and other sounds with motion in moving pictures. Scott Conant, an American chef, restaurateur, food personality, and cookbook author. John S. Monagan (1911–2005), mayor, congressman, author and biographer of Oliver Wendell Holmes, Jr.
Terry Tata, Major League Baseball umpire from 1973 to 1999. During his career, he officiated four World Series and three All-Star games. ^ Smith, Willaim (1994). A biography of Waterbury. Westinghouse. p. 24. ^ a b "Profile of General Population and Housing Characteristics: 2010 Demographic Profile Data (DP-1): Waterbury city, Connecticut". U.S. Census Bureau, American Factfinder. http://factfinder2.census.gov. Retrieved September 26, 2012. ^ "Census 2010 News | U.S. Census Bureau Delivers Connecticut's 2010 Census Population Totals, Including First Look at Race and Hispanic Origin Data for Legislative Redistricting". 2010.census.gov. 2011-03-09. http://2010.census.gov/news/releases/operations/cb11-cn70.html. Retrieved 2012-12-24. ^ History, Knights of Columbus Supreme Council, url accessed September 21, 2010. ^ "Mickey Mouse Clock - Free Flash Clock by Adam Dorman - Digital Artist". Adamdorman.com. http://www.adamdorman.com/preview.php?TableName=flash_clocks&image=0. Retrieved 2012-12-24. ^ "Geographic Identifiers: 2010 Demographic Profile Data (G001): Waterbury city, Connecticut". U.S. Census Bureau, American Factfinder. http://factfinder2.census.gov. Retrieved September 26, 2012. ^ "Monthly Averages for Waterbury, CT (06702)". The Weather Channel. http://www.weather.com/weather/wxclimatology/monthly/06702. Retrieved March 30, 2012. ^ "Connecting the Community". CTTransit. http://www.cttransit.com/routesschedules/display.asp?divid=%7B79203109-8b49-44b8-a1fc-bfb7f4a5f1ff%7D. Retrieved 2012-12-24. ^ "The Best & Worst Places to Live in America". Wisdomportal.com. http://www.wisdomportal.com/Books/BestPlacesToLive.html. Retrieved 2012-12-24. ^ "Oh, the Brass!". Forbes. 2008-04-07. http://www.forbes.com/forbes/2008/0407/103.html. Retrieved 2012-12-24. ^ "Finch, mayor of biggest city, doesn’t earn biggest salary". ctnews.com. 30 August 2012. http://blog.ctnews.com/connecticutpostings/2012/08/30/finch-mayor-of-biggest-city-doesnt-earn-biggest-salary/. Retrieved 16 December 2012. ^ Hochswender, Woody (February 24, 2008). "For Rowland, Second Chance of a Lifetime". The New York Times. http://www.nytimes.com/2008/02/24/nyregion/nyregionspecial2/24colct.html. Retrieved May 27, 2010. ^ "Disgraced ex-governor plans to take job in city with corrupt past". The Hour. 2008-01-24. http://news.google.com/newspapers?nid=1916&dat=20080124&id=MHZIAAAAIBAJ&sjid=iQUNAAAAIBAJ&pg=3454,996896. Retrieved 2012-12-24. ^ "Portuguese Embassies in USA". Portugal.com. http://www.portugal.com/information/embassies. Retrieved 2012-12-24. ^ "Waterburyfiredepartment.Com". Waterburyfiredepartment.Com. http://waterburyfiredepartment.com/. Retrieved 2012-11-09. ^ "wtbypd". wtbypd. http://wtbypd.org/. Retrieved 2012-12-24. ^ "brasscitylife.org". brasscitylife.org. http://www.brasscitylife.org/. Retrieved 2012-12-24. ^ Issues. People. Events.. "Issues. People. Events. | Waterbury Connecticut's Independent Newspaper". Waterburyobserver.org. http://www.waterburyobserver.org/. Retrieved 2012-12-24. ^ Murray, John. "Transformation Of Apothecary Hall Into Luxury Apartments In Downtown Almost Completed". http://waterburyobserver.org/node/781. Retrieved 24 December 2012. ^ "Waterbury - Christopher Columbus". Vanderkrogt.net. http://www.vanderkrogt.net/statues/object.php?webpage=CO&record=usct17. Retrieved 2012-12-24. ^ Glasmeier, Amy (2000). "Chapter 9 Only the Young Survive: The U.S. Watch Industry between the World Wars and after World War II". Manufacturing time: global competition in the watch industry, 1795–2000. Guilford Press. pp. 189–192. ISBN 1-57230-589-4. http://books.google.com/books?id=cVUSauNST8EC&pg=PA189&dq=waterbury+clock+company+World+War#v=onepage&q=waterbury%20clock%20company%20World%20War&f=false. Retrieved 2009-11-06. ^ "Holy Land USA. Roadside America". Roadsideamerica.com. http://www.roadsideamerica.com/holy/index.html. Retrieved 2012-12-24. ^ Ned Lamont | News. Web.archive.org. Retrieved on 2013-07-15. ^ "Top Sen. Inouye Aide Elected to Prestigious Honor". US Fed News Service, Including US State News – via HighBeam (subscription required). October 14, 2008. http://www.highbeam.com/doc/1P3-1575929871.html. Retrieved July 6, 2013. ^ "Allie DiMeco". IMDB. http://www.imdb.com/name/nm1822801/. Retrieved October 27, 2012. ^ "Damane Duckett". Pro-Football-Reference.Com. http://www.pro-football-reference.com/players/D/DuckDa20.htm. Retrieved October 27, 2012. ^ "Waterbury CT Mayors". Dan.greaterwaterbury.com. http://dan.greaterwaterbury.com/waterbury_mayors.php. Retrieved 2012-11-09. ^ "HOTCHKISS, Julius, (1810 - 1878)". Biographical Directory of the United States Congress. http://bioguide.congress.gov/scripts/biodisplay.pl?index=H000809. Retrieved October 27, 2012. ^ "Fred Klobedanz Statistics and History". baseball-reference.com. Retrieved 2010-11-27. ^ "Dylan McDermott". IMDb. http://www.imdb.com/name/nm0001518/. Retrieved October 27, 2012. ^ "MONAGAN, John Stephen, (1911 - 2005)". Biographical Directory of the United States Congress. http://bioguide.congress.gov/scripts/biodisplay.pl?index=M000847. Retrieved October 27, 2012. ^ "Jimmy Piersall Stats". Baseball Almanac. http://www.baseball-almanac.com/players/player.php?p=piersji01. Retrieved October 27, 2012. ^ iPad iPhone Android TIME TV Populist The Page (1958-12-08). "Rambler in High Gear". Time.com. http://www.time.com/time/magazine/article/0,9171,864549,00.html. Retrieved 2012-12-24. ^ Kingsbury, Kathleen (May 2008). "The 2008 TIME 100". TIME Magazine (Time Warner). http://www.time.com/time/specials/2007/article/0,28804,1733748_1733754_1735344,00.html. Retrieved 2008-05-14. ^ "Sheryl Lee Ralph". IMDb. http://www.imdb.com/name/nm0005336/. Retrieved October 27, 2012. ^ "RICHARDS, Mark, (1760 - 1844)". Biographical Directory of the United States Congress. http://bioguide.congress.gov/scripts/biodisplay.pl?index=R000217. Retrieved October 27, 2012. ^ "Connecticut Governor John G. Rowland". National Governors Association. http://www.nga.org/cms/home/governors/past-governors-bios/page_connecticut/col2-content/main-content-list/title_rowland_john.html. Retrieved October 27, 2012. ^ Stowe, Stacey (April 2, 2005). "Rowland Begins Serving a Yearlong Prison Sentence". New York Times. http://select.nytimes.com/gst/abstract.html?res=F50F17FC3A5B0C718CDDAD0894DD404482&n=Top%2fReference%2fTimes%20Topics%2fPeople%2fR%2fRowland%2c%20John%20G%2e. Retrieved May 27, 2010. ^ "Rosalind Russell". IMDb. http://www.imdb.com/name/nm0751426/. Retrieved October 27, 2012. ^ "Dave Wallace". NBaseball-Reference.com. http://www.baseball-reference.com/players/w/wallada01.shtml. Retrieved October 27, 2012. This page uses content from the English language Wikipedia. The original content was at Waterbury, Connecticut. The list of authors can be seen in the page history. As with this Familypedia wiki, the content of Wikipedia is available under the Creative Commons License.